Low-cost carriers, in particular Wizz Air and Ryanair, stand to benefit the most from the 03-Feb-2012 suspension of services at Hungarian flag carrier Malev. Budapest-based Wizz Air was already the second largest carrier in the Hungarian market and has now become the country’s largest carrier. Ryanair, which only late last month unveiled plans to resume service to Budapest, will become within a few months the second largest carrier in Hungary in the post-Malev era. Lufthansa, as the largest remaining legacy carrier in the Hungarian market, is also poised to benefit from Malev’s grounding. Malev had accounted for a 47% share of capacity (seats) in its home market. Most of this share will be absorbed by LCCs although total traffic at Budapest Liszt Ferenc International Airport, which is owned by a private consortium led by Germany’s Hochtief, will likely decrease as its status as a transit hub is lost. Malev had been pushing to raise Budapest’s profile as an international hub, focusing on east-west connections. Malev's collapse saw oneworld overnight drop from the leading alliance in Hungary to the third largest after Star Alliance and SkyTeam. The LCC penetration rate in Hungary prior to Malev’s grounding stood at a relatively modest 24%, down from as high as 28% in 2005 (see Background information). Following Malev’s suspension, the LCC penetration rate in Hungary shot up overnight to about 40% and could easily surpass 50% as LCCs are more likely than full-service carriers to expand in Malev’s absence. Ryanair has already announced a massive expansion at Budapest which will give it 31 routes at the Hungarian capital, which is almost as much as what Malev operated although Ryanair typically serves most of its routes with limited frequencies. Wizz also quickly announced a significant capacity increase for Budapest that will see it launch only one new route but add capacity on 20 of its 23 existing routes. The Hungarian government is now desperately searching for a new investor to take over Malev, provide new capital and resume operations. But this effort could prove challenging given Europe’s bleak economic outlook this year and the lack of suitable buyers. There are now several governments in the Central and Eastern European region looking to sell their flag carriers to strategic investors but there is a very small pool of potential buyers. The most likely buyers are to the east – in particular Etihad Airways, Qatar Airways and Turkish Airlines – but these airlines can afford to be very selective in who they choose to invest in as there are about 10 airlines in Europe currently courting them. Etihad's apetite for additional acquisitions may be decreasing since it has already recently acquired stakes in Air Berlin and Air Seychelles. The only Western European airline group currently willing to consider new acquisitions, British Airways and Iberia parent IAG, could potentially be enticed to look at Malev because of their oneworld connections. But IAG is more interested in investments in Asia and Latin America, or European airlines with large exposure to Asia or Latin America (such as TAP Portugal). While Hungary’s government continues to believe that the country can support a full-service network carrier, this may ultimately prove to be not the case. In 2008 Malev ended its long-haul operation that saw service primarily to New York and Toronto, leaving Malev with a short-haul regional network. Hungary is a relatively small market and at the time of its collapse Malev was only a short-haul operator, serving over 40 destinations with an all-narrowbody fleet of 22 aircraft (including 18 Boeing 737s and four Bombardier Dash 8 turboprops). Neighbouring Slovakia, for example, currently has an LCC penetration rate of over 70% and no longer has a flag carrier. Most of the void left by Malev’s in the local market (excludes Malev’s transit passengers) can be filled relatively quickly by the fast-expanding LCCs. 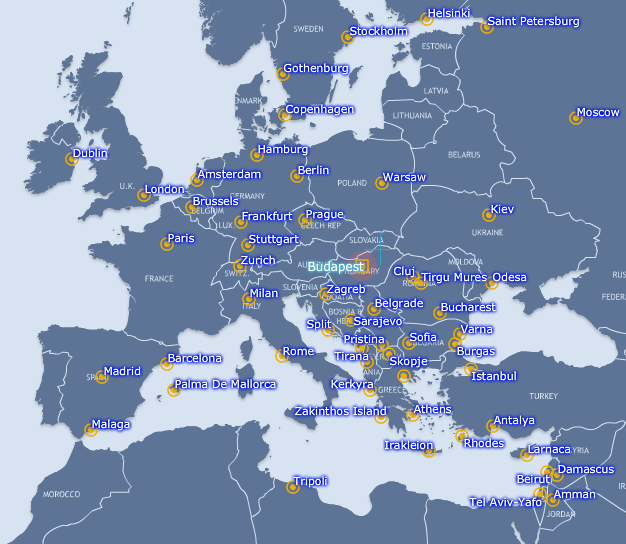 Several European flag carriers will also likely add capacity at Budapest as they look to take over Malev’s local premium traffic as well as the carrier’s long passengers, who were primarily connecting at larger European hubs onto long-hauls flights operated by Malev’s partners. But the premium and long-haul portions of the local Hungarian market are clearly much smaller than the economy short-haul portion. In recent months Malev had been profitable on an operating level but had significant debt burden, exacerbated by a Jan-2012 European Commission ruling that Malev received illegal state loans of EUR280 million between 2007-2010 and would have to pay back a percentage to the government. After the ruling, and in the days preceding its grounding, Malev said its position was no longer sustainable. The day prior to its collapse Malev was placed under special government supervision, akin to court protected restructuring. As Hungary’s only other home-grown carrier, Wizz Air is naturally well positioned to fill the void left by Malev. In fact, a market without Malev is likely a scenario Wizz Air management has pondered since Wizz Air's 2003 establishment. Wizz Air until now has not been able to pursue rapid growth in its home market, prompting it to establish other bases throughout Central and Eastern Europe. Prior to the Malev grounding, Wizz Air accounted for 10% of capacity (seats) in Hungary and had only three A320s based at Budapest. Wizz Air, which immediately announced special fares to help stranded Malev passengers, says it will add two Airbus A320s to its Budapest base next month for a total of five aircraft. The carrier now operates 67 weekly flights at Budapest to 17 destinations. Its newly expanded summer 2012 schedule will feature 129 weekly flights to 23 destinations. Five of the six new destinations Wizz Air was already planning to add this summer with only Bucharest being added after Malev's grounding (see Background information). Wizz Air, which will initially operate four weekly flights to Bucharest, will only offer about one-fifth the total capacity provided by Malev on the Budapest-Bucharest (BUD-OTP) route. But as Bucharest was one of Malev’s biggest destinations for transit passengers and as the route is also served by Romania’s Tarom, the new capacity provided by Wizz Air may be sufficient to meet local demand for origin & destination traffic. Rapid expansion could be difficult to pursue for Wizz Air as it is a relatively small LCC group by European standards with a fleet of just over 30 A320s. For now the group is able to pursue some capacity increases by increasing utilisation of its Budapest-based fleet and shifting aircraft from some of its other bases. Wizz Air’s Budapest operation now accounts for only two of its 10 largest routes and less than one-fifth of the group’s total capacity. At Budapest, Wizz Air currently only serves one destination, London Luton, with more than seven flights per week. But under the newly revised summer schedule, five destinations will have more than seven weekly frequencies: London, Brussels, Eindhoven (Amsterdam), Rome and Milan. Amsterdam, Brussels and Milan were also among Malev’s top 10 destinations. Perhaps recognising Malev was in trouble, LCCs were already in the process of increasing their presence in the Hungarian market. Ryanair already had plans in place to launch five routes from Budapest in March. The Irish LCC almost immediately after Malev’s grounding announcement decided to accelerate its launch of services at Budapest to 17-Feb-2012. It also announced it would add 26 more routes at Budapest for a total of 31, all of which will be in place by the end of July and most and which will be launched by April (see Background information). Ryanair was able to accelerate the expansion of its new Hungarian operation as it grounded 80 aircraft this Northern Hemisphere winter in order to adjust to decreased demand. Ryanair has not yet stated how many frequencies each route will be served with but Ryanair typically launches routes with very low frequencies and this will likely be the case with almost all of its Budapest routes. The carrier did state it would open a base at Budapest with a fleet of four 737-800s, which would suggest a slightly smaller operation than Wizz Air as Wizz Air will soon have five A320s at its Budapest base. Ryanair’s Budapest routes will serve half of Malev’s top 10 destinations, although at alternative airports: Amsterdam, Milan, London, Paris and Warsaw. London Stansted was already among the five Budapest routes Ryanair announced in January (the others being Birmingham, Bologna, Bristol and Dublin). London is the biggest destination from Budapest with three carriers at all of the city's airports now providing over 11,000 seats in each direction. Ryanair previously served Budapest before withdrawing in 2010 after a dispute with Budapest Airport management over fees. Ryanair was always bullish on the prospects at Budapest, likely because it considered Malev a weak competitor, both in terms of having a high cost base and weak strategic direction. At the time of its 2010 withdrawal Ryanair said it would have opened 25 new routes at Budapest if fees had decreased. Ryanair typically pursues rapid network expansion when opening a new gateway. In this case Malev’s grounding has prompted an almost unprecedented expansion for a new destination. Ryanair, given its massive network and fleet, has more flexibility than Wizz Air or almost any other LCC to rapidly expand at any base. As a result, it could easily base more aircraft at Budapest later this year and potentially surpass Wizz Air as the largest carrier in Hungary. easyJet, which is currently the second largest LCC in Hungary with a 3% share of capacity prior to Malev’s suspension, also has the flexibility to expand rapidly in Budapest. easyJet already operates six routes to Budapest. Three of these are to airports in London and Paris. As Paris and London were two of Malev’s four largest destinations it is likely easyJet will increase capacity on its Paris Orly, London Gatwick and London Luton routes even if it elects not to launch new destinations from Budapest. Only three LCCs besides Wizz Air and easyJet currently serve Hungary – Norwegian, germanwings and UK-based jet2 – all with a small number of flights at Budapest. Several other European LCCs are now likely to be enticed to launch services to the Hungarian capital. Czech LCC SmartWings has already indicated it now aims to resume service to Budapest and hybrid German carrier Air Berlin already has announced plans to almost immediately launch flights to Budapest, with a daily service from its Berlin hub to begin on 6-Feb-2012. While the European full-service carriers that are now serving Budapest are unlikely to launch new routes, several will likely end up increasing capacity. Lufthansa, the largest foreign carrier serving Hungary, has already announced additional flights from Berlin and Hamburg. Prior to Malev’s grounding, Lufthansa had an 7% share of capacity in the Hungarian market. Lufthansa subsidiaries Swiss, Austrian and Brussels Airlines also serve Budapest, giving the Lufthansa group a 12% pre-grounding share. As a result, Lufthansa is currently the largest player in the Hungarian market from an airline group perspective. Wizz Air, however, will have more capacity in Hungary than the Lufthansa group once it expands its Budapest base in March and Ryanair will also likely have more capacity than Lufthansa in Hungary by the middle of this year. Star Alliance carriers are likely to see a big uptick in business from Hungary. In addition to a strong presence by the Lufthansa group, Turkish Airlines is the fifth largest foreign carrier servicing Hungary. Turkish provides a key Star link to the east for Hungarian passengers heading to Asia, the Middle East or East Africa. Poland’s LOT also is likely to benefit not only with an uptick in business from the local Hungarian market but an increase in its transit traffic. LOT, like Malev, has been focusing on growing its east-west connection business. Three other Star carriers have similar east-west focuses – Austrian, Slovenia’s Adria Airways and Croatia Airlines – and will also likely absorb a portion of the transit traffic previously carried by Malev. British Airways, which is now the second largest foreign carrier in the Hungarian market with a 6% pre-grounding share of capacity, will also likely increase capacity to Budapest in attempt to keep within the oneworld alliance the premium and long-haul passengers which had been loyal to Malev. Finnair, which is currently the only other European oneworld carrier serving Budapest, will help BA with the fight to keep all of the premium and long-haul passengers which previously booked on Malev from straying over to Star or SkyTeam (while Malev did not have a long-haul network, it offered long-haul destinations via its oneworld partners). BA’s sister carrier Iberia does not currently serve Hungary but could also look to launch service to Budapest to replace Malev’s Madrid service. Royal Jordanian entering the market would also make sense to replace Malev's Budapest-Amman route and provide oneworld a connection from Budapest to the east with both O&D traffic to Amman and connection traffic over Royal Jordanian's Amman hub. But there will simply be no way for oneworld to even come close to entirely replacing Malev, which while small played a key role in providing connections to eastern Europe, in particular the Balkan region. Malev had only five destinations no other oneworld carrier serves: Bosnia-Herzegovina's Sarajevo, Montenegro's Podgorica, Romania's Cluj-Napoca and Tirgu Mures and Ukraine's Odessa. While on a number basis that is a small loss, oneworld members cannot efficiently serve many of Malev's 38 other destinations as doing so would require significant backtracking through the Helsinki, London or Madrid (and soon Berlin) hubs. Uncertain is American Airlines' service from New York to Budapest, launched in Apr-2011. The route was made possible by Malev's exit from the long-haul sector as well as anti-trust immunity with British Airways and Iberia that supported additional traffic feed. But these benefits alone did not help sustain the route, as American for its winter 2011/2012 schedule initially dropped the frequency from daily to four weekly and later decided to suspended all winter service until Apr-2012. In Jan-2012 American pushed back resumption of the route until Jun-2012. With American no longer having Malev to provide onward connections, coupled with European economic woes and high fuel prices, American's Budapest service will be difficult to sustain and is unlikely to resume. Delta Air Lines, which was the only other US carrier serving Hungary, also has suspended Budapest services for all of 2012. Of the global alliances, oneworld had a 53% share of capacity in Hungary prior to Malev's grounding and after the grounding became the country's third largest alliance behind Star and SkyTeam. Malev is the second oneworld member, after Mexicana, to suspend services in less than two years. The alliance also had a second setback on 3-Feb-2012 as India's Kingfisher, which was planning to join oneworld later this month, indefinitely postponed plans to formally enter the alliance. SkyTeam also will likely see an uptick in long-haul and premium traffic to/from Budapest as Air France-KLM account for over 6% of pre-grounding capacity in the Hungarian market. 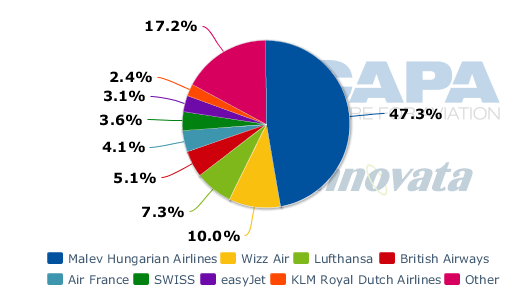 Two other SkyTeam carriers, Aeroflot and CSA Czech Airlines, also each have 2% capacity shares in Hungary. SkyTeam had a 10% share of capacity in Hungary prior to Malev's grounding while Star had a 17% share. The Star and SkyTeam shares will both increase but in the post-Malev era over 50% of the capacity in the Hungarian market will likely be non-aligned, as the LCCs fill most of the void left by Malev. While Wizz Air and Ryanair will clearly be the largest beneficiaries from a pure passenger number standpoint, the impact on several European flag carriers could be very meaningful in a different and unmeasureable way. Given the tough conditions they currently face, European flag carriers need all the help they can get. This is particularly the case for the smaller carriers of Central and Eastern Europe, many of which will need their own cash infusions and/or privatisations to survive 2012. With Malev and Budapest as a transit hub erased from the map, the hubs of all these carriers and their business models just became slightly stronger. With that the probability of securing new investors and therefore avoiding the fate now bestowed on Malev has increased.